I took a near empty bus to Andheri train station. The road trip took 16 minutes. The metro-rail would have taken 4 minutes. The BEST fare was Rs10, which is significant for a 3.0 Km distance. I got off on Gokhale Bridge adjacent to Andheri Train station and studied the linkages between BEST bus terminal, train station and metro-rail station. I was disappointed is the kindest comment I have. Even as we have a world class metro system, our mass transit managers still work in their own silos and refuse to co-ordinate with each other. I have highlighted in bold italic my criticism of our mass transit managers. I felt I need to explain what was in my mind. Let me brief the view of Andheri Train Station standing on the Gokhale Bridge which connects Andheri West with Andheri East and lies a hundred meters at south-end of the station. In the picture below, a train is ready to depart on harbour line platform 7 on its journey to city centre. The entire train station with its 7 platforms is about 600 meters long. The first railway over-bridge is visible in the picture, located beyond platforms 7 and 6 almost 400 meters away from Gokhale Bridge. Within the train station, there are three more over-bridges for the use of bona-fide train travellers only, to enter and exit the platforms. These are not to be used as thoroughfare by others. The picture above shows a close-up of about 200 meter long suburban train of Western Railway (WR) docked at a platform in Andheri station. It is bound for Borivli, a suburb much father to the north. A railway over-bridge is visible within the station. The elevations of the power cables, their support pillars and roof over platforms are visible clearly which to even a layperson a preliminary idea of the possibilities to comfort and convenience of commuters and general public. The general public who are not train travellers have to shuttle on foot between two parts of their neighbourhood despite the railway tracks bi-furcating into west and east. Options like use of two-wheelers and three-wheelers like autos are not commercially available. There is no way other than walking around the railway stations. Those lazy or unwilling take short-cuts. They trespass the railway property through unauthorized holes and gaps cut through the compound walls the railways erected to control offenders and ticketless travellers. They risk their lives crossing the tracks at any location convenient to them and in their mad rush to avoid coming under trains run and stumble, getting hurt in the process. Sometimes, they are run over and killed. The railways found a solution to this long pestering problem. They designed elevated foot-bridges which are officially named as skywalks. Most suburban train stations have already completed building skywalks at-least on one-end of the station, if not at both ends. 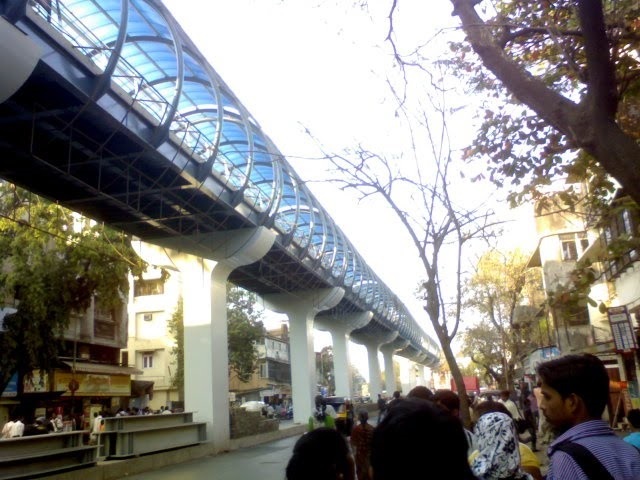 Andheri station has skywalks at its north-end towards Borivli and lying between it and the Andheri Metro Station. However, in their wisdom, MMRDA did not connect this skywalk to its own entrance and exit gates. 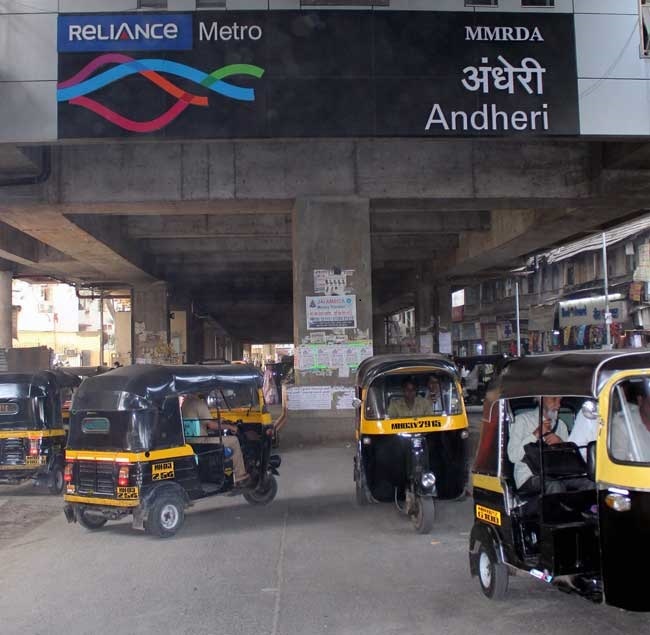 Andheri Metro Station lies about 50 meters away from where the Skywalk ends. A commuter from has to exit and walk down to road level, squeeze through the hawker infested pavements and then climb the skywalk to walk another 100 meters to arrive at the ticketing counters of the Andheri train station. And then move onward to the nearest over-bridge leading to the station, in order to continue onward travel by a train. The autos crowding haphazardly below will not oblige to go the short distances. Nor would an average person like to waste money and time on them. The seriousness of this inconvenience of non-linkage between metro, skywalk and train station hits a commuter and general public hard only if he is an aged citizen or a physically challenged person. Or she is a pregnant woman or a mother with a toddler in a baby-walker. The city planners do not seem to live in a real world where all we all have needs to be understood and catered to the best of global standards. Below is the picture of Andheri Metro Station, at platform level. It is a trip down the stairs about three stories of a regular building from the platform to the exit gates and then another two stories down to the road level. Need for Physical stamina or lack of it may eventually dissuade elders and weaklings to continue the road transport modes, thus not relieving pressure on our buses, cars, taxis, autos and the like. 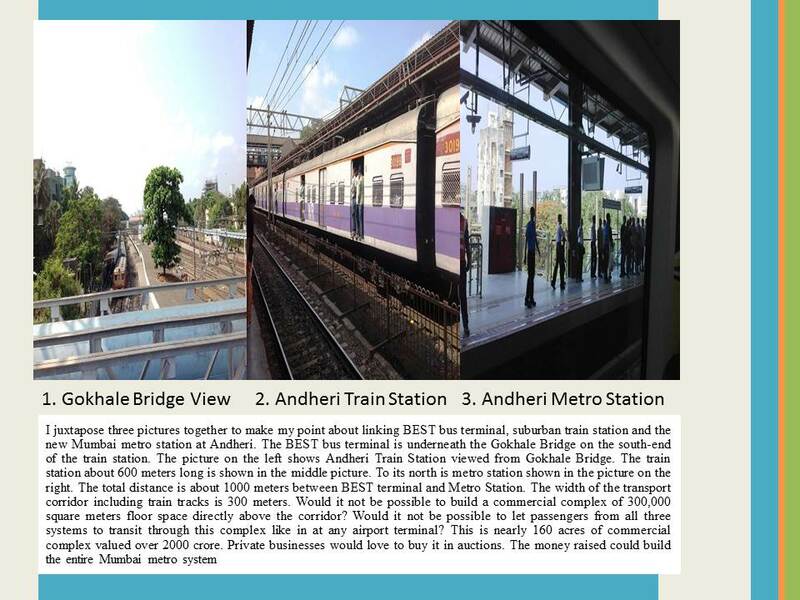 I have added a brief presentation of the commercial opportunity that MMRDA missed because it could not co-ordinate with railways and to some extent BEST. It is not a novel concept. It is concept tried in every developing country and those who did their city planning right, including city like Bangkok. Extremely valuable observation by Philip. Most countries in the world are connecting train, metro and bus to airports as much as possible. In India, government departments are failing to coordinate with one another. Transport, environment / forest, railway, Electricity are each others enemy and not willing to integrate towards common mans comfort. Resources are wasted by not attempting to connect rail, airport, metro or state road transport for the benefit of commuters. Duplication of efforts and resources spent will only add to economic woes! Look at our own Bajpe airport- even after half a century, it is still isolated without being connected to fluent mass transport modes! A week later, I checked the Mumbai Metro yesterday as Sunday revelers flocked in unprecedented numbers. Ghatkopar and Andheri stations were jam packed. The metro security personnel had tough time to manage the commuter crowds. The lack of planning of handling train and metro inter-connectivity posed a real challenge in crowd control. Metro will attract tourists for many more Sundays and holidays.